To best explain the configuration steps, we will be using the below network diagram. Install the Hotfix on Gaia R77.30 Security Management Server and R77.20/R77.30 Security Gateways. It is required for both the vSEC Gateway and the vSEC Controller. The version must be GA (no Hotfix). If a previous Hotfix is installed, consult with Check Point before you install this Hotfix. This Hotfix may overwrite custom features of an earlier installed R77.20 Hotfix. Before you start these procedures, install and configure the required VMware component. You can install more than one ESXi host. 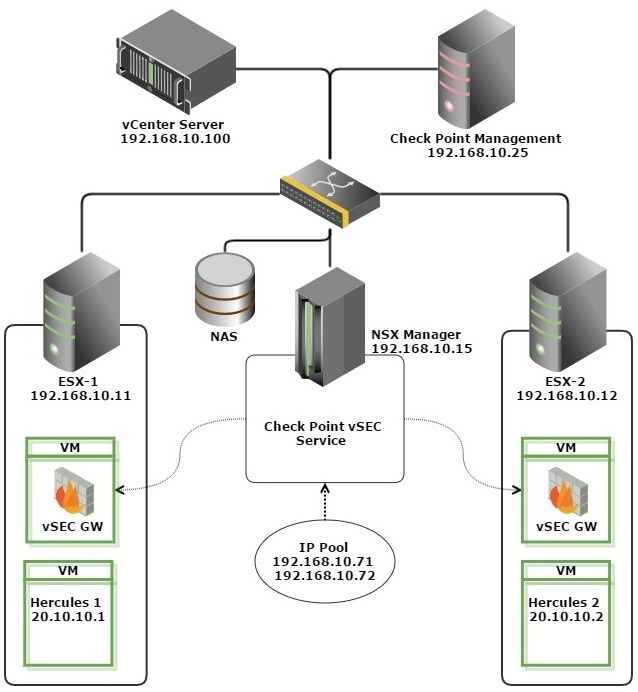 The Check Point Management server must have network connectivity to the vCenter server and NSX Manager during the registration steps. The ESX hosts must have full connectivity with the vCenter server during the deployment procedure. After you complete service registration, you can deploy the vSEC Gateway with the vSphere Web Client. See the VMware documentation to learn more about service deployment. We recommend that you create pool for automatic assignment of management interface IP addresses. This procedure uses an Agent VM, for an environment with a local Datastore. If you will use an external Datastore, have its details ready before you begin. This procedure shows the basic steps and options for configuring a Security Group. See the VMware documentation for conceptual information, detailed procedures and explanations of the different objects and options. Create a cluster object, with vSEC Gateway members. Each gateway will automatically get the license attached to the cluster. Note: You can also configure redirection rules from Partner security services > Firewall. How to verify that traffic is redirected and inspected by gateways.